Representative example for the ŠKODA KODIAQ (7 Seats) Edition 1.5 150PS 4x4 model, with Quartz Grey metallic paint and spare wheel. Based on a 48 month, 36,000 mile agreement. Please note *At the end of the agreement there are three options: i) pay the optional final payment and own the vehicle; ii) return the vehicle: subject to excess mileage and fair wear and tear, charges may apply; or iii) replace: part exchange the vehicle With Solutions Personal Contract Plan. 18s+. Subject to availability & status T&Cs apply. Ordered by 01/07/2019 from participating retailers. Indemnities may be required. Offer may be withdrawn at any time. Accurate at [04/2019]. Freepost ŠKODA Financial Services. ŠKODA UK may change RRPs at any time (this includes where there are government changes in regulation and/or legislation). There may be a delay to any RRP displaying correctly on our materials. 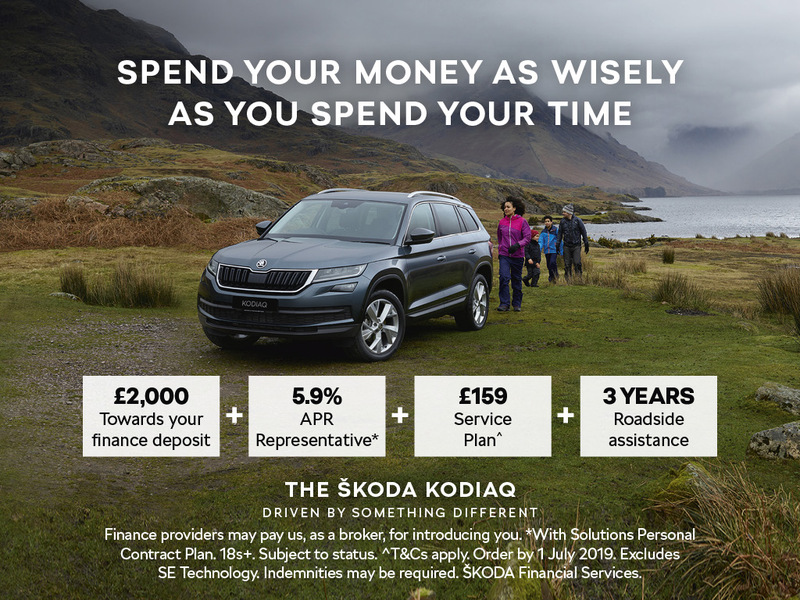 Always obtain prices from your chosen ŠKODA retailer.